Excavation was conducted for 6 weeks, from June 2 until July 15, followed by 3.5 weeks (July 16-August 9) of study, cataloguing, and processing of finds at the Institute for Aegean Prehistory Study Center for East Crete (INSTAP-SCEC) in Pacheia Ammos. The primary target area of the excavation was the peak and southern and northeastern slopes of the South Acropolis (Areas A and B). 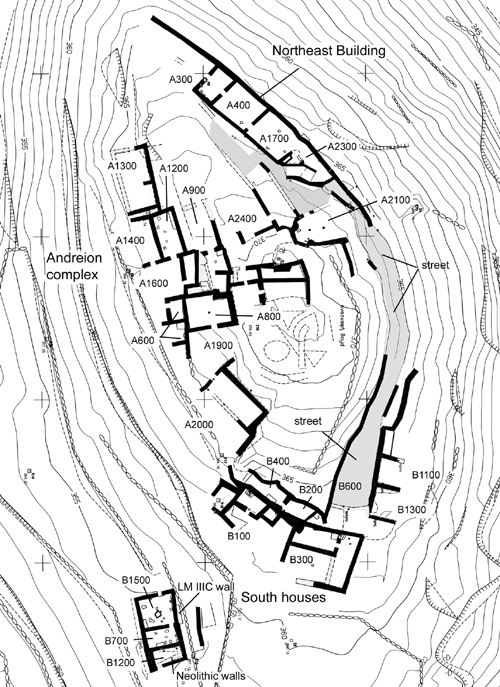 The aims of excavation in 2003 were to clarify the architecture and contexts of the andreion complex on the west slope; to examine the communication patterns and the system of roads on the southeast slope, in order to establish a link between the spine wall and south houses with the northeast area; to explore the early stratigraphy of the site, with the goal of understanding the transition between Early Iron Age and Archaic as well as Final Neolitihic and Late Prepalatial occupation patterns; and finally to define the extent and character of Hellenistic reoccupation of the hilltop. Work in 2003 on the southeast slope of the South Acropolis exposed a wide street (B600) that ascends the slope in a northeasterly direction, connecting the south-slope houses with buildings on the northeast. Below the street, an Archaic building was recovered (B1100; 1300), which was reused in the 3rd century B.C., altering both the form and function of the rooms. The Hellenistic modifications involved the addition of walls and a bin, as well as the construction of a waste pit or koprana which contained a deep fill of debris, ostensibly waste discarded from the hilltop. This Hellenistic reuse of the Archaic houses represents the first primary deposits of post-Archaic date so far recovered on the hilltop. New trenches opened on the southwest terrace (B700-800; 1200; and 1500), revealed a series of three rooms of Archaic date. The construction date of the building is Orientalizing, with modifications in the 6th century and abandonment at the end of the period. The northernmost room is a large kitchen with a rectangular built hearth, connected by means of a doorway to a storeroom in the south. Excavation beneath the floor of the southernmost room revealed that the rooms were built into the terrace, disregarding and perhaps even demolishing LM IIIC and Early Iron Age constructions. A sounding under the Orientalizing floor of the southernmost room demonstrated that the south wall of the room and its floor were built directly on top of an LM IIIC surface. Beneath the LM IIIC level were found a series of three surfaces and house walls of Final Neolithic date. The walls indicate two separate buildings backing onto a narrow alley. Work on the West Slope continued the exploration of the andreion complex (A1900-2000), revealing a series of three rooms including A800 excavated in 2002. The southernmost of the units was excavated completely in 2003 (A2000), exposing a large and elongated room with megalithic walls on the east and south. The discovery of a terracotta krater stand, similar to those found in A800, is indication of potential function as a place for ceremonial dining. 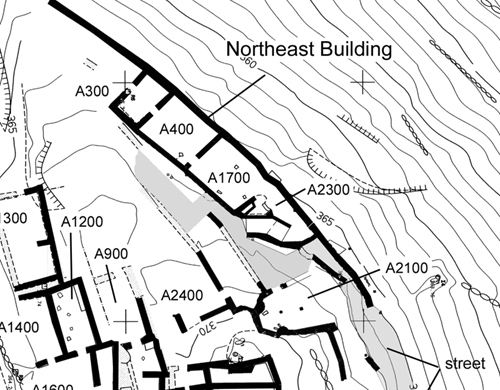 Excavation on the northeast slope revealed two rooms connected to A400 (A1700 and A2300), forming a single building comprised of A300, A400, A1700, and A2300. A1700 appears to have been a storeroom, while A2300 is an access ramp from a street, a corridor and small storage area. The street discovered west of A2300 runs north-south, before turning east in front of a kitchen in A2100. Following the street to the east along the southern edge of A2300, it turns southward along the inside of the spine wall, joining the street in B600 to the south. 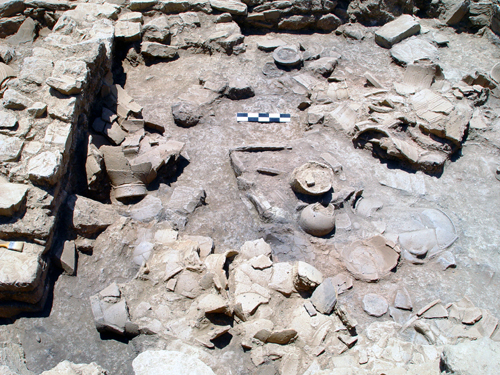 The University of North Carolina at Chapel Hill and the American School of Classical Studies at Athens completed its second season of excavations at the site of Azoria (Azorias) in the region of Kavousi in northeastern Crete, from June until August 2003. The project is conducted by permission of the Greek Ministry of Culture and under the auspices of the Archaeological Service of Eastern Crete. 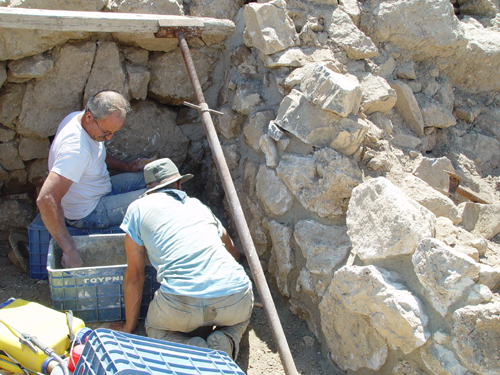 Excavation was conducted for 6 weeks, from June 2 until July 15, followed by 3.5 weeks (July 16-August 9) of study, cataloguing, and processing of finds at the Institute for Aegean Prehistory Study Center for East Crete (INSTAP-SCEC) in Pacheia Ammos. The primary target area of the excavation was the peak and southern and northeastern slopes of the South Acropolis (Areas A and B). A total of 18 trenches were opened in 2003, across a total surface area of about 0.11 ha., concentrated around the peak of the South Acropolis. The aims of excavation in 2003 were to explore the northeast slope of the South Acropolis, further defining the buildings recovered in A200 and A400, by expanding excavation to the south of these trenches (A1700-1800; 2100-2400); to excavate the southeast corner of the peak of the South Acropolis, in order to link the buildings and spine wall in B300 with the northeast slope and to define patterns of communication between north and south sides of the peak (B600; 900;1100; 1300); to expand excavation along the west slope, clarifying the plan and function of the andreion and associated structures (A1900-A2000); and to begin examining the lower western terraces of the site by excavating test trenches in the area southwest and below B100 (B700; 800; 1200; 1500). 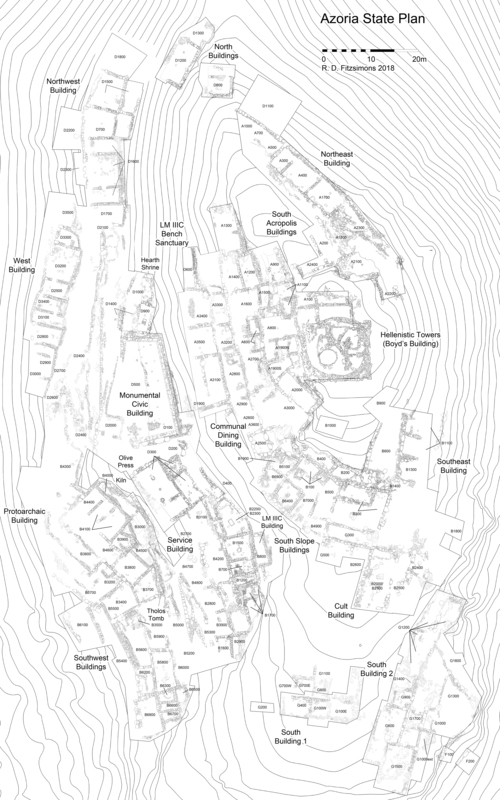 Our interest in exploring the lower terraces was to begin studying the plan, organization, and character of the settlement outside of the upper spine wall, in order to assess functional differentiation areas of the settlement, house types, and communication routes. The lower terraces also afford the opportunity to examine stratigraphically the earlier—pre-Archaic—phases of the site (Final Neolithic; Late Prepalatial; Late Minoan IIIC; Early Iron Age), which on the hilltop are preserved only in bedrock deposits. The 2003 staff consisted of 72 people: the Project Director (Donald Haggis); Field Director (Margaret Mook); Zooarchaeologist (Lynn Snyder); Palaeoethnobotanists (Margaret Scarry and Amanda Tickner); Physical Anthropologist (Maria Liston); wood carbon palaeobotanist (Maria Ntinou); Architect (Rodney Fitzsimons); Topographer/surveyor (Georgos Damaskinakis); Excavation Foreman (Manolis Kassotakis); Conservator (Kathy Hall); Chief Conservator and Architectural Conservator (Stephania Chlouveraki); Artist (Roxana Docsan); Pottery Registrar (Alicia Trimble) and Finds Registrar (Yuki Furuya). There were six trench supervisors (N. Doub; M. Eaby; K. Killgrove; S. Pak; G. Park; P. Vanaria); fifteen workmen (D. Chalkiadakis; S. Papadakis; A. Dantes; A. Syritoules; S. Koutsakis; M. Kophinakis; N. Kophinakis; I. Papadakis; G. Kanitakis; P. Hantzidakis; B. Phiorakis; M. Dantes; E. Maniadakis; E. Sobanakis; N. Spiliarotis); and four potwashers (K. Daskalogianaki; S. Tzari; K. Philipaki; A. Tzani); and 32 student volunteers. Funding for the project was provide by the National Endowment for the Humanities (RZ-20812); the Loeb Classical Library Foundation; the College of Arts and Sciences, the Office of the Vice Chancellor for Research, and the Department of Classics of the University of North Carolina at Chapel Hill; the Institute for Aegean Prehistory; the INSTAP Study Center for East Crete (in kind). 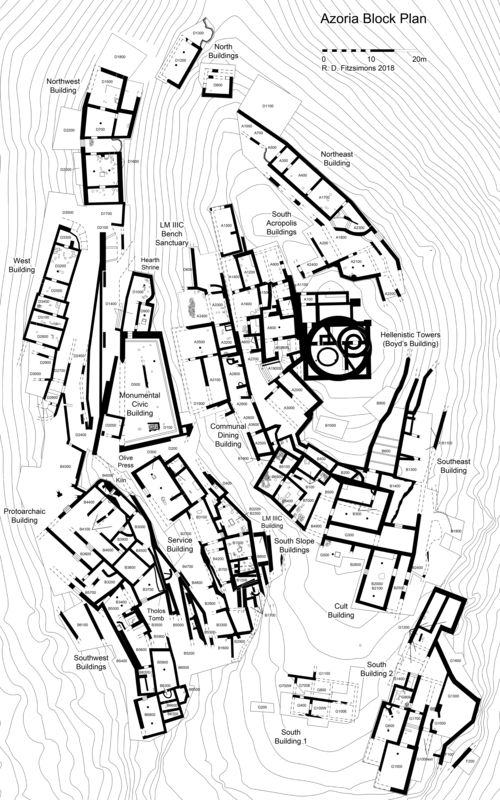 The goals of excavation are (1) to understand the formal organization and physical structure of the Archaic Cretan city by extensive exploration of seventh, sixth and early fifth century levels, which have demonstrated both settlement size and formal features that indicate an urban structure, such as city planning and monumental architecture; an andreion; and centralized food storage and processing. (2) To recover stratigraphic evidence for changes in economic systems and sociopolitical behavior in the transition from the Early Iron Age to the Archaic period, as the basis for examining the processes involved in urbanization. (3) To explore the Final Neolithic, Late Prepalatial, and Late Minoan IIIC-Late Geometric levels as a comparative background for the analysis of the political economy of the Archaic town, as well as important phases in the emergence of complex societies on Crete and as units of settlement systems in the broader region. The area of visible cultural material (primarily sherds, stone-tools, metals, and architecture) on the surface of the site is about fifteen ha total. The zone acquired for excavation in 2002 consists of the hilltops and immediate slopes, about two to three ha, covering both North and South “Acropoleis”. The primary goal of sampling is to recover contexts that permit the study of functional differentiation of architectural spaces across the site, considering the relationship between public and private space, and domestic, civic, and cultic spheres of activity. Given the unevenness of the terrain and that architecture is exposed across much of the surface of this target area, we defined trenches by visible architectural spaces rather than a measured grid. This flexible definition of the size of sample units required that trench lines, datum points, benchmarks, and survey points had to be located with a GPS as needed during the course of excavation. While the excavation method emphasizes architectural spaces, the focus on crop and livestock processing and consumption necessitates the measurement of the total volume of matrices excavated, and the examination of interior and exterior spaces, large contiguous contexts—suggesting associations between buildings and areas of the site—as well as diachronic changes in the form and function of the buildings. Our principal objectives in 2003 were to continue exploring the topography of the Archaic town and the stratigraphy of the site. Trenches were located within two broad sampling areas on the South Acropolis, labeled A and B on the plan. Within these units the excavation and sampling method was consistent. 100 percent of matrices in all stratigraphically significant deposits, or what we call “intensive sampling loci” (e.g., floors; habitation debris; ceiling debris, wall collapse and tumble; floor packing; hearths; bins; vessels in situ; fill deposits), was dry-screened with a quarter-inch sieve, collecting all artifacts, stone tools, bones, and occasional botanicals. Each of six trenches working simultaneously at any given time had a single sieve in operation; a sieving team, usually consisting of two individuals, conducted the dry-screening under the supervision of the science director Lynn Snyder or bioarchaeologist, Maria Liston. The total volume of all matrices of all loci (stratigraphic units) was measured during the dry-sieving stage, by counting standard twenty-liter buckets (zembilia). This intensive sieving maximized the recovery of bones of small animals, fish, and shell fragments. Occasionally larger-size botanical materials, such as olive stones, were found in the quarter-inch mesh. With this rigorous daily sampling specifically in mind, the rocker screens were designed in 2002 by the excavation foreman, Manolis Kasotakis, in consultation with the field director. The screens are made of aluminum—and thus reasonably easy to move around the site—and consist of three basic parts: (1) a removable screen inset which has a 1.00 x 0.61 m framework to which wire mesh is fixed with bolts, rivets or solder; (2) a removable frame, 15 cm deep and lined with a coarse hardware cloth, into which the screen inset is placed (and removed for cleaning, repair, and replacement); and (3) a four-legged base, which has an opposing set of swinging axles designed to hold the frame in place, suspending it over the discard pan which slopes at an angle. The removable frame allows for easy cleaning (and dumping of coarse stone debris), while the discard pan contains and channels the fine dirt directly into a discard chute or wheelbarrow. “Intensive sampling loci” were also defined as deposits requiring more intensive collection for flotation. Flotation was conducted at the INSTAP Study Center for East Crete. Routinely soil was retained for flotation in the form of five-liter standard samples that were obtained from every locus excavated, while targeted or “intensive sampling” was conducted in definable features and stratigraphically significant loci such as floor deposits, destruction debris, and closed contexts. Intensive samples consisted of an average of 20 liters per locus (as much as 100 liters per locus). In 2003, a total of 346 soil samples were taken for flotation. The carbonized plant material from the residue (coarse fraction), such as seeds and tiny fragments of wood carbon, is sorted and analyzed at the INSTAP-SCEC, while the entire light fraction (flot) is scanned, sorted, and studied at the Research Laboratories of Archaeology at the University of North Carolina at Chapel Hill, the permit for which is currently pending. Larger carbonized organic material, consisting of pieces of wood and plant fiber, occasionally preserved in the clay matrix of floor and ceiling material, from both 2002 and 2003 seasons, was sorted, examined, and preliminarily analyzed by Maria Ntinou. Ntinou who has applied for a permit to have the material transported to the Wiener Laboratory of the American School of Classical Studies at Athens for analysis in 2004. This permit is pending. 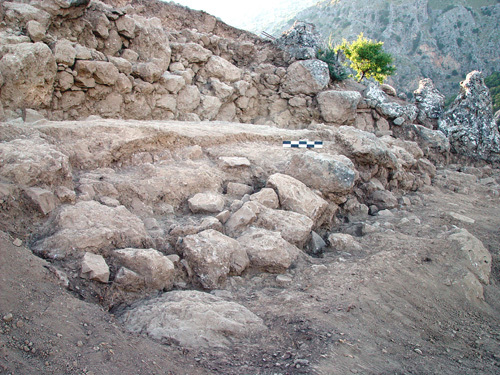 Excavation conducted in B600—north of the corridor house in B300—recovered ca. 10 m. segment of a megalithic terrace wall which runs north-south from the east end of B200, at the point where the B200 wall turns sharply south creating a narrow, curved end to the building. The wall borders a wide street along its east side, which appears to bank up slope and continues around the east side of the peak. The street, about 3-4 meters wide, is supported by the eastern extension of the spine wall which runs around the east side of the hilltop, forming the back wall of rooms of a building below in B1300 and B1100. The street’s surface is an eroded rough but soft gravelly layer, with a consistently loose matrix. Given its orientation to the Archaic walls and the building in B200, the street appears to be an Archaic installation that was evidently an exposed surface at the time of the reoccupation of the site in the 3rd c. B.C. While the street deposits are mixed, Hellenistic pottery was consistently present. The street’s surface is bisected at intervals along its ascent by a series of stone-built divisions which helped to retain the road packing and metal against the erosive slope. While the road is traceable for a distance of about 20 meters, we have not recovered its full extent across the east side of the peak. Supported by the spine wall on the east, the street runs along the 365 m. contour and can be projected to connect to street in A2100 on the northeast. The street terminates outside the eastern end of the room in B200, narrowing to a two-meter wide sloping bedrock path—a small courtyard or alley. One wonders if the B200 north wall was not curved at this juncture to accommodate the north-south street. This area at the end of the street is a blind alley providing access to the narrow stairway in the back of the east room of B300. Excavation of the eastern corner of the room in B200 revealed that the north wall of B200 curves sharply south against the north wall of B300; an L-shaped bin, partially exposed in 2002, was built just east of a screen wall that closes off the east end of the room, forming a kind of vestibule or closet. A 0.70 m. opening in the north wall’s second course—between the north face of the north wall of B300 and the B200 north wall—may indicate the location of an access (narrow doorway) to B200. The space seems too narrow for a doorway and if providing access to exterior space, one would expect to find a door pivot and better-constructed threshold. A number of large boulders, probably fallen from the megalithic terrace wall, were found on the street (fig. 2), perhaps indicating a post-Hellenistic earthquake destruction—evident also in the dispersed pattern of boulders recovered from across the south slope of the peak. In 2002 we were uncertain about the date of the widespread—evidently seismic—destruction apparent across the site (especially on the saddle of the South Acropolis and along the south slope, where large boulders— parts of walls or the architectural terrace for the hilltop buildings—are found on top of Archaic wall tumble and habitation debris). While our initial suggestion in 2002 was a date between the early fifth c. and the third century B.C., we now have unequivocal evidence of this stone debris lying directly on top of Hellenistic surfaces. While the evidence from the street is not conclusive, Hellenistic contexts in B1300 and 1100 (see below), east and immediately below the street, provide good indication of a post-3rd century destruction. 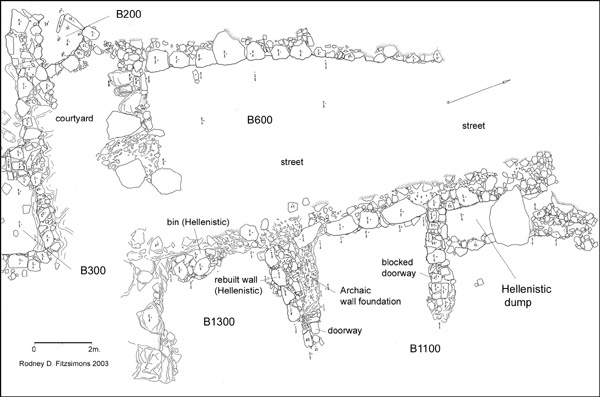 Excavation east of the street in B600 revealed a series of three connected rooms, on a level lower than the street and utilizing the eastern segment of the spine wall as the back wall of the building. This is to say that the building backs onto the spine wall, which in turn forms the retaining wall for the street above in B600. The building itself seems to have been constructed in the Archaic period—based on the architecture and the earliest preserved floor deposits—but was reused and partially rebuilt in the 3rd century. The south and west walls of the southernmost room (B1300) are worked bedrock, with only a trace of building along the west. The dolomite bedrock has been cut back and smoothed forming a regular angle in the southwest corner of the room; the east wall is no longer extant. The foundation of the room’s northern cross wall also consist of worked bedrock—in this area a consolidated brecciated or eroded dolomite (alatsopetra). This bedrock material is preserved to a considerable height (ca. 0.60-0.70 m.), evidently forming the socle for the wall. It ends at a worked edge on its eastern end where several blocks of sideropetra form a built doorjamb and threshold. The wall does not continue east of the built threshold. Built on top of the remnants of Archaic roofing material, which are preserved as patches along the western half of the room, there are two significant Hellenistic renovations: one is a wall built parallel to and in front of the worked-bedrock north cross wall, against rocky fill (which may be the remains of wall tumble from the Archaic building). The stones are four boulders (ca. 0.60 m. in length), built on a low bedding of cobbles, and reducing the width of the room by as much as one meter— to about four meters. The preserved length of this wall is about 2.40 m. The second feature consists of a roughly constructed bin or trough against the western bedrock wall; the construction forms a rough semicircle of cobbles and small boulders, about .70-.80 m. in height, with three rough courses of stone, and no regular corners, faces, or angles. The specific function of this room and these features remain uncertain. While the renovations make use of the top of the Archaic level as a floor surface, it is very rocky and weathered, perhaps indicating partially covered or even exterior space. North of the room in B1300 is B1100 where excavation revealed another room of similar size (l. 3.50 m.) connected by a doorway. This southernmost room of B1100 has a patch of Archaic floor sealed by ceiling clay (roofing material), preserved along the west half of the room. The room’s north wall is constructed of dolomite and crystalline limestone boulders and cobbles, utilizing cut bedrock foundations. A built doorway (threshold and jamb), possibly blocked off in the 3rd century, is preserved on the eastern end of the wall. As in B1300, the eastern edge of the room is no longer extant. A large boulder, lying on top of Hellenistic material was found in the southern half of the room. There is no specific evidence of room use in either Archaic or Hellenistic phases. The north room of B1100, was also constructed in the Archaic period, but apparently reused in the 3rd century B.C. as a refuse pit or dump, containing an extraordinary array of ceramic material and other finds. A small single-faced screen wall or retaining wall was constructed on top of the Archaic roofing material, evidently to retain the fill. The wall is made of small boulders and cobbles and preserved only to one course in the south. It extends north-south across the width of the room, perpendicular to and abutting the cross wall separating the rooms in B1100. A large boulder fallen on top of the wall in the middle of the room obscures the details of its construction at this juncture. The northern segment of the wall makes use of small stones and appears preserved to three courses. While the function of the retaining wall is not certain, it appears to have contained a deep layer of Hellenistic fill that extended across the extent of the room and apparently spilled out over the edge of the wall itself on the east. It is likely that the doorway separating the rooms in B1100 was blocked as part of the 3rd century construction of the pit and containment of the dump. The blocking of the door and the construction of the screen wall, perhaps after the room’s eastern wall had fallen away, suggests the purposeful design of the refuse pit—a koprana—perhaps for the use of the inhabitants of the circular building on the hilltop, which was excavated by Boyd in 1900. The matrix of the fill is loose dark brown rocky soil with dense animal bone, pottery, and other objects. The preserved depth of the dump is about 1.0 m. on the west, sloping to about 0.50 m on the east where the building’s western wall and surface has eroded away. The animal bones are well preserved suggesting refuse deposition in the building rather than slope wash debris or occasional discard. Another indication of refuse debris is the lack of terracotta roof tiles; surficial slope wash debris, found in top soil and surface lots on the slopes of the South Acropolis, uniformly and characteristically contain terracotta roof tiles, building debris that we think originates in a large Hellenistic building—a circular tower-like structure on the hilltop. The refuse pit of B1100 lacks such roof-tiles suggesting a discard context contemporary with the occupation or use of the hilltop. The objects include terracotta lamps, three iron points, a piece of copper, a terracotta bull figurine, three loom weights, four iron nails, one bronze nail, one bronze pin, and two stamped amphora handles. Exploratory trenches along the south shoulder of the peak produced only surficial slope-wash debris and eroded bedrock material. A small segment of a retaining wall was uncovered in B900. Southwest of B100, on the second terrace below the upper spine wall, excavation in four trenches revealed a series of three rooms forming parts of two buildings: from north to south, B1500, B700 and B1200. The buildings appear to have been constructed in the seventh century, remodeled in the sixth, and abandoned at the end of the Archaic period. The stratigraphy of the southwest area suggests that the Archaic building was built into the slope, stabilized on the west by a megalithic spine wall. The renovation of the terrace significantly altered the topography of the area, perhaps destroying earlier LM IIIC-Geometric buildings, suggested by the presence of Early Iron Age pottery (LM IIIC, PG, and LG) that was consistently present in slope wash and upper levels across the terrace. Furthermore, in B700, on the terrace above and east of the Archaic building, a segment of an LM IIIC wall was preserved. The east wall of B1500 appears to have been built against this LM IIIC wall and to have preserved the LM IIIC surface at this upper level. Excavation in B700-800 will continue in 2004, with the aim of recovering more of this LM IIIC building. About 0.60-1.0 m. above the LM IIIC wall in B800 is another poorly-preserved segment of wall foundations belonging to the Archaic period. We hope that EIA stratigraphy is preserved below this wall down to the level of the LM IIIC wall in B700. Another indication of the Archaic modification of the slope and destruction of EIA levels is the presence of an LM IIIC surface under the seventh century floor in B1200. In general, the excavation of the southeast terrace revealed both the depth and preservation of stratigraphy on the lower terraces. cobbles and small boulders in its construction; the coursing is regular, but the stones themselves require ample mud mortar, and the spacing between stones is usually irregular and wider than with sideropetra. This is especially visible along the entire east wall of the structure, spanning all three rooms (B1500, 700, and 1200). The south and west walls of B700 appear to use the similar materials and construction methods, perhaps suggesting contemporary building. Large dolomite boulders are used for the foundations of the north wall of B1500, a segment of the west wall of B1500, and the west wall of B1200. These areas are considered parts of the original building. The renovation, sometime in the sixth century, is apparent in the upper courses of the north wall, the cross wall between B1500 and 700, and the west wall of B700. In these areas, sideropetra (gray crystalline limestone) is used, almost to the exclusion of dolomite; the stones are closely set in regular courses. While the dolomite wall faces are sometimes roughly worked, the blocks of sideropetra form naturally flat and smooth surfaces. The two northern rooms (B1500 and 700) both suffered catastrophic destructions at the end of the sixth century or beginning of the fifth century. Burnt debris, carbonized wood and burnt plant material is found among the roofing material and habitation debris throughout. Frequently the yellow-green clay floor and roofing clay are burnt red with patches of ash and carbon. The largest northern room, B1500 (figs. , is about 22 square meters in area (ca. 4.30 x 5.00 m.), with a built stone bench in the southwest corner and a built hearth off center in the middle of the room. The hearth is square in shape, constructed with a series of schist stones and lined with phyllite clay on the bottom; a small opening in the northeast corner is supported by a flat limestone paver that extends out side the hearth. This stone is a work platform, pot stand, or would have facilitated removing the ash and debris from the hearth. Five flat stones—pithos stands—are apparent around room near the north and east walls, while two flat stones north and south of the hearth are probably post supports. Other features include a door pivot on the east side of the doorway in the north wall. In the hearth itself was found a terracotta strainer, and next to it, outside the hearth, a cookpot. Scattered around the room were several pithoi, a number of basins, bowls, stone tools, and a variety of small vessels and other objects. The actual contents of this room will require extensive conservation and study in 2003-2004. During excavation several pithos scatters were identified: one along the south wall; one in the center of the room north of the hearth; and two concentrations along the east wall of the room. We estimate, before conservation, that there are about nine pithoi in the room. Identified preliminarily before excavation were 23 stone tools, six lekanae, one exaleiptron, one black glass oinochoe, one black-figure skyphos, one small mortar, one large terracotta lamp; one lekythos, at least four amphorae, two or three cookpots, one small pithoid jar, two hydrias, four or five high-necked cups; bowls, including one bowl with a nozzle. Among the other finds, there are a number of terracotta loom weights; spindle whorls; stone and terracotta lids; terracotta bull figurine; a bronze balance pan; two bronze fishing hooks; a bronze nail; an iron ring; an iron nail; a terracotta bead; and a calcite bead. The room’s function as a kitchen is indicated by the features and the assemblage. Botanical remains include olives, grapes, wheat, and possibly barley. A doorway, through the north wall leads into yet another room left unexcavated in 2003. A doorway in the east end of the south wall leads into a room in B700, a storeroom of smaller dimensions (2.50 x 4.50 m.) that contained seven pithoi, four amphorae, three hydrias, a lamp,two high-necked cups, one plate, one spouted cookpot, and one bowl, as well as two large stone mortars. A low stone bench or work platform is located against the south wall. Other features in the room include two post supports on the east-west axis, a door pivot at the east end of the north wall—built with three stones— and a number of flat stones evidently used as pithos stands; such stands are characteristic of store rooms of the period. Given the size of the room and the number of pithoi, the space is likely to have functioned as a storage area for the neighboring kitchen. While the destruction date of the room in B700 is late sixth century, the neighboring room to the south (B1200) appears to have gone out of use at the end of the seventh century, perhaps the time at which renovations were made in the B700 and B1500 to the north. The room is the smallest by far—2.20 x 4.50 m.— and the function is not certain. Access into B1200 appears to have been in the southwest corner where a door would have led into another room to the south yet unexcavated. 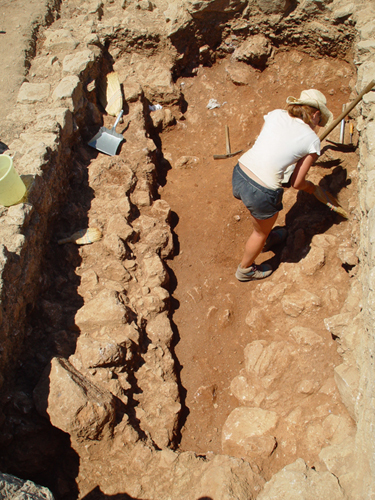 Excavation in a sondage through the floor of this southernmost room revealed that it was constructed on top of a surface of Late Minoan IIIC date—an indication of the extent of the rebuilding of the Iron Age terrace. Below this surface, excavation revealed a sequence of three Final Neolithic surfaces associated with at least two architectural phases. The architecture consists of two walls, the back walls of two separate buildings, which we expect continue underneath the LM IIIC and Archaic levels to the north and south of this trench. The walls are constructed of local dolomite fieldstones—there is no obvious use of gray crystalline limestone—and the surfaces are hard packed red dolomite clay. The walls run at oblique angles, roughly east-west, apparently converging in the east side of the terrace, creating a rather narrow triangular exterior space between two separate buildings. Lenses and pieces of green phyllite clay, perhaps roofing material from the adjacent buildings, were found throughout. In addition to pottery, a large number of dark gray, black, and red chert blades, flakes, production materials was recovered, in addition to a bone awl and several basalt beads. 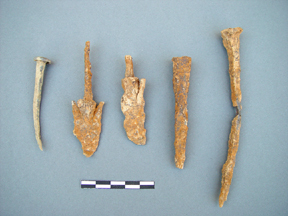 A total of 102 unused flakes and pieces of nodules and debitage as well as 18 tools (blades, scrapers, and cutting tools) were found throughout the Neolithic levels with most materials concentrated in levels B1215.3; 1217.1; 1218.1, representing the primary occupation surfaces between these two buildings. B1217-1218 represents floor surfaces that belong to the earliest surface and the north Neolithic wall; B1215.3 represents the later surface, apparently in use with the construction of the south wall (B1214). There may also be a surface at B1216. Exploration of the LM IIIC and Final Neolithic settlements on this terrace will continue in 2004. Work in the northeast area of the peak is a continuation of excavation that began in 2002. The initial aim was to complete the excavation of A400, exposing the southeast quarter of the room and the southeast wall. The spine wall forms the northern limit of the rooms along this terrace, but as was the case in 2002, the floors of the rooms are eroded at the edge of the terrace some 1.0 m. from the inner edge of the spine wall; so, the actual position of the northern wall, which must have used the spine wall for its foundations, is not known for certain. The full extent of the room and the east wall of A400 were defined in 2003. A400 is 6.0 m. long (northeast-southwest dimensions) and about 4.50 m. wide suggesting a total area of over 27 square meters. A pithos stand was found in the southwest corner of the room and a fragmentary pithos—the neck and rim—against the east wall just north of the doorway. Two agrimi horns were also recovered on the east side of the room, near a doorway in the east wall leads into yet another room (A1700). The doorway near the southwest corner of the room in A400 (east wall) is situated toward the south side of the wall, that is, off the central axis of A 400 and A300. It leads into yet another large room of similar dimensions (A1700), but slightly larger than A400—almost 32 square meters in area, about equal in size to the store room with the stands in the andreion in A800. This room has in situ a central pillar base and two pithos stands in the southeast corner. Finds from the room included an agrimi horn, a silver pin, and at least two pithoi (before conservation). The back, eastern wall, of the room has a possible doorway on the north end (between the north end of the wall and the spine wall) where the dolomite bedrock foundations have been cut at a right angle, possibly to accommodate a doorjamb. This back wall of A1700 separates the room from A2300 to the southeast. A1700 and A2300 appear to have been connected by a doorway. This doorway, possibly the back door to the building comprising A1700, A400, A300 and A500, leads into a narrow corridor in A2300, 1.20 meters wide, formed by the spine wall on the northeast and a small stair on the south. The stair, a single course of stones about 1.10 m. wide that ascend southwest directly from the corridor into a small triangular shaped room, about 2.00 meters north-south by about 1.50 m. east-west, utilizing the back eastern wall of A1700 as its western limit. Along this wall is stone-built bin. The corridor continues east, past the stair, and then turns a sharp corner southwest up a bedrock cut ramp bordered neatly on the east by a curving wall. Finds in this corridor, ramp and bin room consist of terracotta loomweights, a spindle whorl, a strip of bronze, and a large saddle quern. At the top of the ramp above the small triangular room is a stair that leads to a platform, originally paved, and further to the west another stair—framed by doorjambs— that leads directly to a street. The street runs southeast-northwest along the contour of the hill and along side the outer, northeastern wall of a building in A200. Following the street southeast, the path leads to a small bedrock courtyard or open area in front of the doorway of A2100, which is a kitchen. From the courtyard one could descend the steep slope of the hill in northeasterly direction down to a curved stair that leads to a landing and corridor or street. The street is preserved for a distance of some 7.0 meters and paving stones were found at the landing and in the southeast; bordered by a wall up slope on the southwest, it continues in a southeasterly direction along the inner face of the spine wall. Presumably this street would have continued around the entire southeast slope of the peak, eventually connecting with the street already mentioned in B600 on the south. Unfortunately excavation in A2200 revealed extreme erosion along the east and southeast side of the peak, obliterating all but segments of the spine wall in this area. The kitchen in A2100 is very well preserved, exhibiting the evidence of the ubiquitous burnt destruction and late sixth-century abandonment phase. The room conforms to the contours of the slope, utilizing bedrock extensively in east, west, and south walls. The south wall is unusual, curving with the natural terrain. Two limestone post bases are in situ down the center of the room; the axis is perpendicular to the room’s access—the doorway on the northwest. A small hearth was found in the southeast corner of the room. It is constructed of limestone blocks and built up against and on top of bedrock. The base of a small pithos—the upper parts of which were recovered from the area southeast of the hearth—was found in the hearth along with a ground stone tool. A single worked limestone block forms a small bench, seat or work platform in the northwest corner of the room, utilizing a rise in the bedrock at this location for its foundation. Other finds in the room include a set of five ground stone tools, including a small quern, a pithos base, a strainer (set against the southwest post base), a fine cup, a coarse skyphos, and a large lekane with reflex handles. Other finds are a large terracotta weight, three pieces of iron, and a piece of lead. Botanical remains from the room, after preliminary analysis, include weed seeds, olives, grapes, wheat, and a number of unidentified grains and pulses. The kitchen’s location is unusual, in that it does not appear directly connected with any other room on the site. It abuts A200 to the southwest, and is accessible from A2300 via the street, but there is no direct access from an adjacent building. A neighboring room in A2200—a segment of wall and patch of floor running northwest-southeast along the contour—was not preserved well enough to indicate its relationship to A2100, but on the evidence, direct access to A2100 seems unlikely. Work on the west slope in 2003 explored the area south of A800, in efforts to expose more of the andreion complex begun in 2002—with the excavation of the storage rooms (A1200, A1400-A1600), kitchens (A600), and the room with the stands (A800). While a doorway in the south wall of A800, suggested the existence of another room to the south, the definition of architectural space was hindered by the extreme depth and density of the wall collapse and fill in this southern area of the west slope. While excavation in A1900 revealed the rough dimensions of the room south of A800, the difficulty in defining the eastern wall of the room, and in managing the deep stone fill and tumble across the trench, precluded completing excavation of this room in 2003. We were able, however, to define and conserve the east wall of A800 (begun in 2002), and to excavate the southernmost room of the andreion in A2000. Excavation across the west slope in 2003 revealed that the large rectangular Archaic building on the hilltop, excavated by Harriet Boyd in 1900, was constructed on top of a massive artificial terrace supported on the west by a line of large boulders, fitted with smaller boulders and cobbles. This roughly built wall retained fill on the east. In front of this massive retaining wall on the west was a deep layer of cobbles and small boulders, forming a kind of wall packing or fill behind the east wall of A2000. The east wall of A2000, a single faced megalithic wall, constructed up against the fill and megalithic retaining wall of the west slope, forms the back wall of a spacious room, exactly 9.0 m. in length, and about 3.0 meters wide. The south wall of the room is constructed of large boulders on a bedding of smaller boulders and cobbles, while the north wall of the room, is a typical cross wall made of regular blocks of sideropetra and dolomite. While this cross wall is slipped down slope on the west—along with the western wall of the room—a doorway is apparent at the western end of the wall, forming an access to A1900 to the north. Thus A800, A1900, and A2000 form a series of rooms, connected by doorways. While A800 and A1900 are situated on a north-south axis, the southernmost room A1900 shifts the orientation of the complex with the contours of the hill giving the room a northwest-southeast orientation. A1900 will be excavated in 2004. The uppermost courses of the west wall of A2000 had slipped out of their original position, making the definition of this wall difficult. Excavation along the western edge of the wall revealed both the south wall of what must be a series of rooms extending south of A600, as well as line of the west wall of A2000, where uppermost courses were completely slipped away. These rooms along the western edge of A2000, as well as the large room’s western wall will be investigated in 2004. Our hope is to clarify the access to the building from the lower terrace. 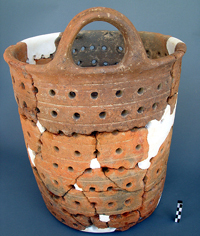 Finds from A2000 include a terracotta krater stand, similar to those recovered in A800 and A1400, a pithos, and several cups. Other finds included an iron fibula, a terracotta loomweight, and an iron nail. While the floor was well preserved across the room, the western edge was severely slipped and eroded. As was the case in A800, this room does not appear to have suffered the burnt destruction apparent across so much of the site. The lack of burning may indicate that the room was reoccupied and reused until the final Archaic abandonment in the first quarter of the fifth century. Architectural conservation was conducted at Azoria for a period of four weeks (June 15-July 15, 2003) concurrent with excavation, in efforts to preempt the degradation or collapse of ancient walls recovered during excavation in 2002 and 2003. This work was conducted at the request and direction of the 24th Ephorate of Prehistoric and Classical Antiquities, under the supervision of Stephania Chlouveraki, the chief conservator of the INSTAP SCEC and the Azoria Project, with the consultation of Alekos Nikakis, the chief conservator of the Ayios Nikolaos Museum and the 24th Ephorate, and Eleni Nodarou, the petrographer of the INSTAP SCEC. The walls of the Archaic settlement at Azoria utilize local dolomite (alatsopetra), crystalline limestone (sideropetra), and phyllites (primarily green and gray schists) in a mud mortar. Ancient houses are constructed on a series of concentric terraces, supported by megalithic retaining walls. While these terraces are generally very stable, the slope of the peak of the South Acropolis is steep (30-40 degrees), and both natural as well as anthropogenic events have caused walls to collapse, shift or slip down slope, or to succumb to catastrophic erosion. In many cases walls on the outer edges of the terraces are not preserved in archaeological contexts, having collapsed or slipped off the edge of the terraces in antiquity. During excavation, efforts were made emergently to support walls that had slipped forward because of erosion or the post-abandonment seismic destruction; or whose upper courses had shifted beyond the line of the wall compromising the integrity of the wall fabric and causing an immediate danger to workmen and archaeologists. The process of wall preparation consisted of (1) cleaning around the individual stones, on the wall faces and top extant course, removing 4.0-7.0 cm. of soil; (2) cleaning the exposed surfaces of the stone with a brush, making sure all points of contact on the stone are clear of dirt; (3) the application of mortar. The mortar consist of a combination of 1 unit of lime (asbeste), 1.5 units of pozalane (thiraike ge)—essentially ground pumice and tephra—1.5 units of calcite sand (ammo asbestike), and 3 units of quartzite sand (ammo chalaziake). The process of mortar application consisted of (1) wetting the wall and ancient mortar with water from a hand sprayer; (2) packing the mortar by hand deep into the interstices of the wall stones, using one’s fingers and small spatulas; (3) when the application began to harden, pounding the mortar with a blunt wooden tool—usually the rounded handle of a small pick or hammer—into the voids, filling the space against the stones and existing soil with mortar; (4) then wiping the surface of the mortar with a damp brush, to give the surface of the application a rough appearance; (5) carefully scraping the edges of the stones in order to remove excess mortar that might be obscuring the outlines and surfaces of the wall stones; (6) while the mortar application is still damp, but consolidated, applying a layer of mud and water—essentially a fine slip—with a brush; and then (7) cleaning the surfaces of the stones with water and a brush to remove excess mortar and mud. Following the initial stages of consolidation listed above, the entire target area was covered with burlap cloth, and the mortar application is allowed to dry over night. Each day for ten days following the initial consolidation, the wall segments were sprayed with water from a hand sprayer and covered with a burlap cloth for drying. This was the procedure followed in all areas of the site targeted for consolidation in 2003. Record photographs were kept of various stages of the consolidation process. In instances in which individual stones of the top courses of walls had slipped out beyond the wall line, thus jeopardizing the stability of the wall and compromising the wall fabric, the following procedure was followed. Excavations was conducted behind the wall stone in question, usually into the wall slipped packing, in order to provide sufficient space to move the stone back into its original position, replacing the packing with the consolidation compound mentioned above. Eight separate areas were targeted for conservation and consolidation in 2003. 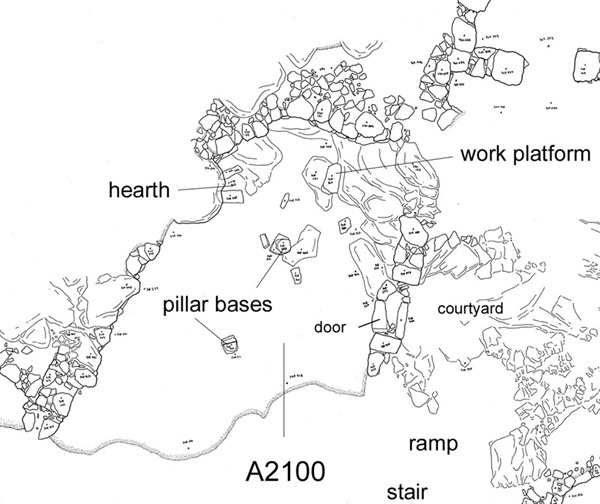 These areas were prioritized based on their condition, stability, environment (slope and drainage pattern), and immediate or future danger to excavation personnel and visitors to the site: All of the walls in B400; the north (spine wall), stair and cross wall of B300; the east wall of A800; the east wall of A1500; the north wall and northeast corner of A1200; the cross wall of A1300; a section of the west wall of A1700; and a section of the southwest wall of A2300. The plan of consolidation work for 2004 is to prioritize walls and buildings on the site based on slope, wall stability, construction materials and methods, and state of preservation with the aim of impeding and halting wall degradation from exposure to the elements. This will involve the continuation of the methods of wall conservation, as outlined above, with the primary aim of conserving sections of buildings in need of immediate consolidation after excavation, or causing a potential work hazard for excavators on the site. Excavation in 2003 exposed much of the South Acropolis permitting us to begin analyzing the relationship between different areas of the hilltop, to examine communication patterns, streets, and the function of the spine wall as an integrating architectural element in the settlement. The discovery of the Hellenistic modifications to the Archaic houses and the 3rd century refuse pit on the southeast slope of the peak demonstrated the nature of reoccupation following the early 5th century abandonment of the site. While Hellenistic sherds and roof tiles are scattered in topsoil and in the upper levels of the slopes around the peak of the South Acropolis, it appears that actual occupation is confined to the peak of the South Acropolis, perhaps consisting of the large circular building excavated by Boyd in 1900. The modifications of the Archaic building in B1100 and B1300 suggest temporary and make-shift accommodations—perhaps sheds for animals installed long after the disuse and collapse of the Archaic-phase constructions. The dump discovered on the northeast side of B1100 further indicates the nature of the Hellenistic reuse of the lower slopes and terraces—material was being discarded from the hilltop, or perhaps from the street above in B600. Continuing exploration of the andreion complex has now demonstrated that the main building consists of three adjoining rooms: a long hall on the south (A2000), a large rectangular room on the north (A800) with the terracotta stands, and a third room, yet unexcavated in between (A1900). One focus of work in 2004 will be to excavate this room, as well as to clarify the use of the terrace below, immediately to the west/southwest; like A600, this may have been a service area for the monumental building. The construction of the andreion halls represents an ambitious building operation, utilizing not only the megalithic wall construction apparent in the spine wall, but also a monumental terrace supporting the building on the hilltop excavated by Boyd in 1900. Trial excavation on the southwest terraces now show vividly the radical rebuilding of areas of the site at the end of the seventh century. The three rooms excavated in B1200; 700, and 1500 were parts of a large building that reshaped the topography of the hillside. The wall foundations seem to have cut through Iron Age buildings, being established directly on an LM IIIC surface; the south wall of B700 appears to intrude on even deeper, Final Neolithic, levels, disregarding the Early Iron Age buildings that must have occupied this slope; the evidence for Early Iron Age occupation is found in mixed Archaic deposits with material spanning the LM IIIC, PG, and Late Geometric phases. Furthermore, the east wall of B1500 was built up against an LM IIIC wall recovered on the terrace above and to the east. One goal of work in 2004 is to explore this LM IIIC building at the juncture of B800 and B1500 in order to clarify the nature of Early Iron Age occupation on the site and the extent of the late 7th century renovation and rebuilding of the settlement. The Final Neolithic levels in B700, indicate that remains of buildings of this date should be found both north and south of the exposed area between the lines of the Archaic walls excavated in 2003. 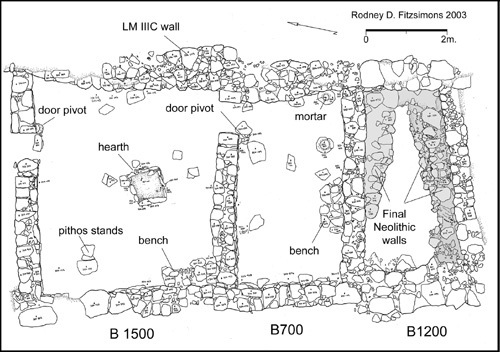 The presence of two walls in B700—the back walls of two separate buildings— may afford the opportunity to explore large contiguous areas of the Neolithic settlement. Furthermore, the discovery of Final Neolithic pottery in other trenches, such as in A400, on the opposite side of the hill (northeast terrace), suggests that the settlement may have been quite substantial, with houses distributed over much of the hilltop. Evidence of local chert tool production provides an interesting contrast with settlements in western Crete, such as Nerokourou, which make primary use of imported Melian obsidian. The FN pottery from Azoria demonstrates, however, a wide range of fabrics such as local phyllite and micaceous wares, but also marble and granodiorite-tempered fabrics which are most likely derived form outside the Kavousi region. The granodiorite wares originate in the Kalo Khorio region across the isthmus of Ierapetra, suggesting economic integration, if not long distance exchange of ceramics or their contents. At Azoria, the problem-orientation emphasizes agricultural production as an identifiable system of economic power in the community, which is potentially recoverable and definable archaeologically. Furthermore, the identification of an urban horizon on the site in the 6th century, suggests hypothetically, a threshold of power, in which centralization of surplus may have been translated into differential access to agricultural land and control of labor. Was the status of this emergent elite reinforced ritually through the exclusionary communal meal in the andreion, as well as by means of acquisition of imports through long-distance trade–especially fine Attic and East Aegean pottery and metals–and through the rationing of foreign “orientalizing” iconography? That is, is this urban phase of the site the first period in which we can see the integration of a wealth distribution system, with obvious external links? New configurations of power might also be evident in the pattern of nucleation, the physical segmentation of the site, and the establishment of the andreion itself, which had potentially important ritual functions in the community. The primary goal of the project is to examine the origins of this political economy, dissaggregating the process of urbanization from the essential sociopolitical relationships that led to the establishment of a city-state at the end of the seventh century B.C., and testing the relevance of the integration of staple finance and wealth distribution systems. The focus of work in 2004 will be on the western terraces, north of B1500, south of B1200 and along the terraces west and down slope of the andreion complex. The purpose of this further work is (1) to complete the excavation of the andreion and to define the communication patterns on the west side of the peak; (2) to expose houses along the slopes below the spine wall in efforts to understand the spatial organization of the city and differentiation of households; (3) to recover industrial or centralized food processing areas of the site; (4) to begin to reconstruct the early, pre-Archaic history of the site by exploring the Final Neolithic, Late Prepalatial, and Early Iron Age settlements.